I love this bracelet. Sorry about the crappy pictures, but I love this bracelet. I made it wish pretty rectangular garnet beads (from patriciasartgallery which now appears to be empty) and brass chain and findings. Then, to keep the clasp at the bottom of my wrist I added a gorgeous brass bunny charm I got from geelizzietwo. I love it because, obviously I love bunnies, but also because it's a simple bracelet that looks perfect with a lot of my outfits, especially the raspberry-purple shirt I'm wearing today. Also while at IKEA (I had a gift card from grad and needed cutting boards, which I did get) I also got a new cover for my IKEA couch. Before it was red: Now it's navy: I know the lighting is terrible, especially in that old shot, but I really think the blue changes the room. 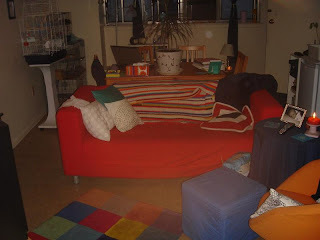 When I was washing the red cover a month or so ago, the couch underneath is an off-white. I liked that change too... really brightened up the room. I love how something so simple can really change the mood... I feel the blue is a little more cool and soothing for summer. Anyway, that's all for now. I've received quite a few packages in the mail recently, so hopefully I'll have a blog up about that soon. In the meantime, have a wonderful week! Long time no " see " ! I LOVE Ikea myself ! we got a black leather sofa from there , and i love the quirky items they come out with now and then ! We did think about the one you got , but it was a little big to go in our chill room for it !